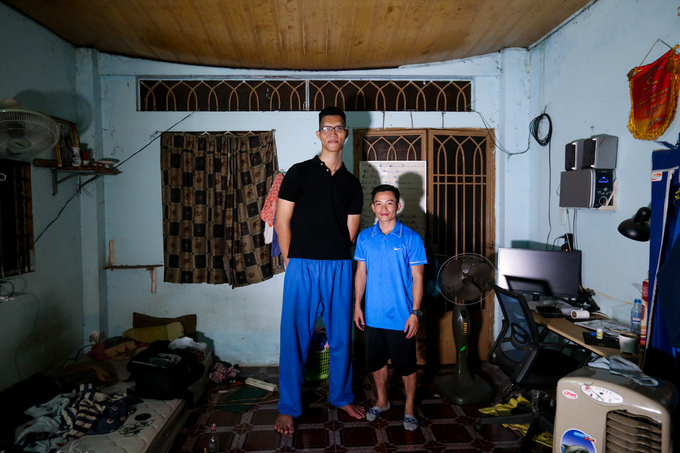 2.2m tall, Tran Ngoc Tu can’t stand erect or sleep in buses and trains, or shop normally for clothes. 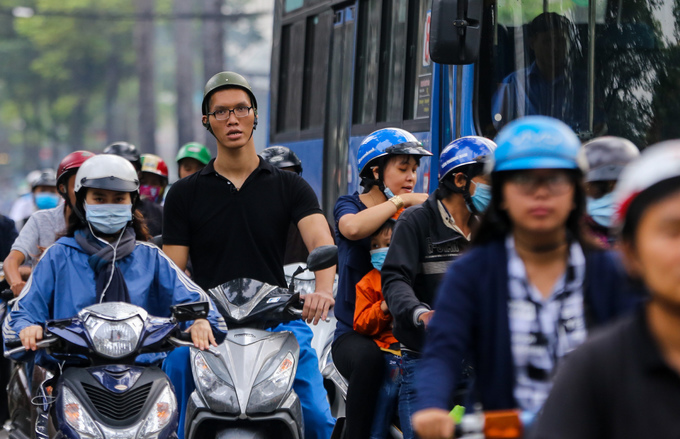 Naturally, the 22-year-old native of Thanh Hoa Province, 150km south of Hanoi, stands out in a crowd. 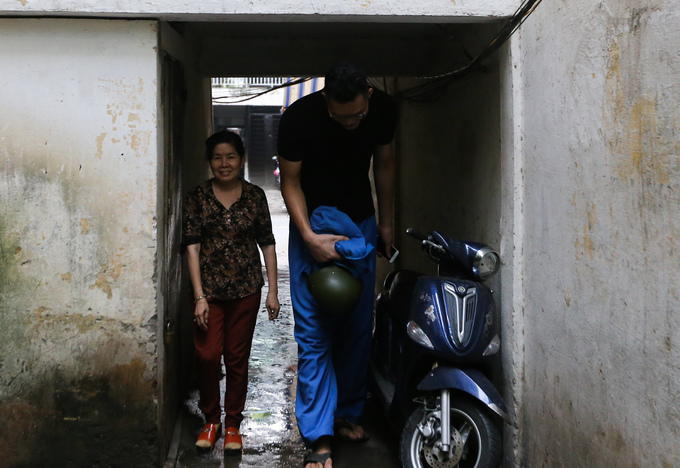 He lives in a shared home with his friend on Ly Nam De Street in HCMC’s District 11. "No one in my family is really tall. But I started growing very fast in secondary school. I was already over 2m tall when I was 16. 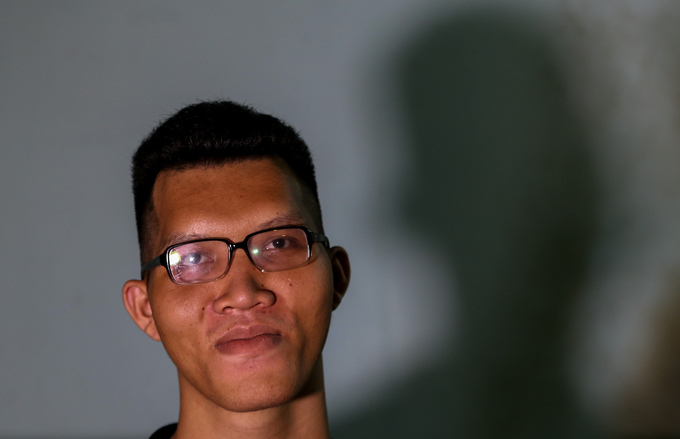 The doctor said I had acromegaly (a pituitary gland disorder) and I can get even taller," Tu said. 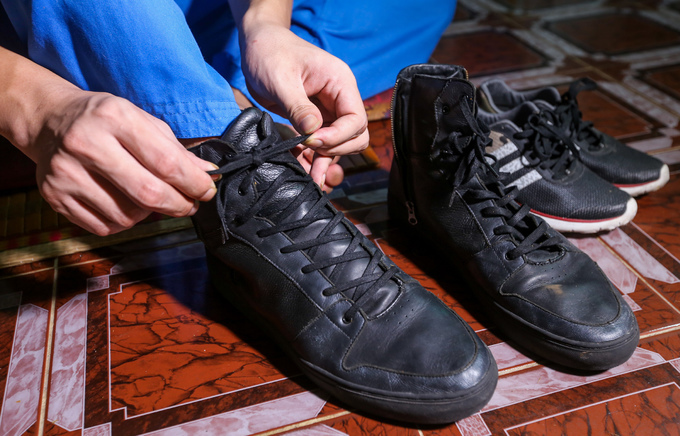 While Vietnamese men and women typically aspire to greater heights, literally, Tu wishes the opposite, literally. This is not very difficult to understand in a country where the average male height is 1.64m. The daily inconveniences are many. Tu has to be alert all the time not to hit his head against ceilings, stoop to really low levels to stand inside a bus, and become a contortionist to enter other vehicles. 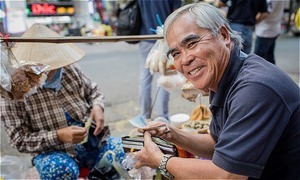 "Sometimes, I would look at every store in the market and find no pair of pants that fit. I have to go to some place that sells clothes for foreigners to find something. My shoes are twice as big as normal, so I have to get them made by shoemakers. 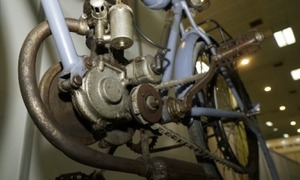 Tu also finds it difficult to drive a motorbike. Since his legs are long, his knees knock against the panel, making them sore and uncomfortable. "With a big body, my back and knees get really sore if I sit for a long time, then I can’t run. My voice is deep because my throat is larger than a normal person," Tu added. Apart from height, his weight of 120 kg also piques the curiosity of onlookers. On Hung Vuong Street, a cyclo driver thought Tu was a foreigner and tried to get him to go on a ride. 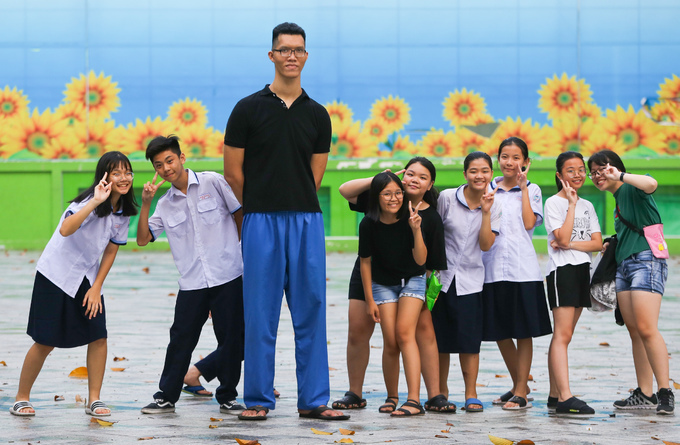 In the park, a group of students excitedly asked Tu to pose for a photo with them. 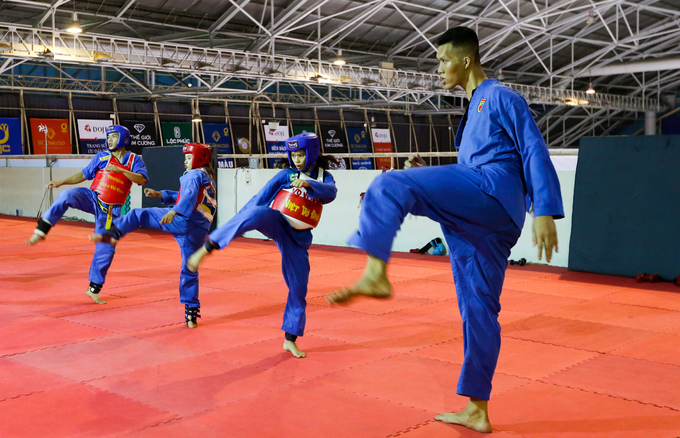 Now, Tu’s main job is to train and compete for HCMC’s Vovinam team (Vietnamese Martial Arts). 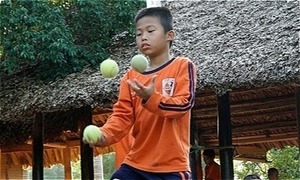 Everyday, he trains from afternoon till evening at the Phu Tho indoor stadium. "I dropped out for secondary school and started to work in the construction industry. Two years ago I moved to Saigon. 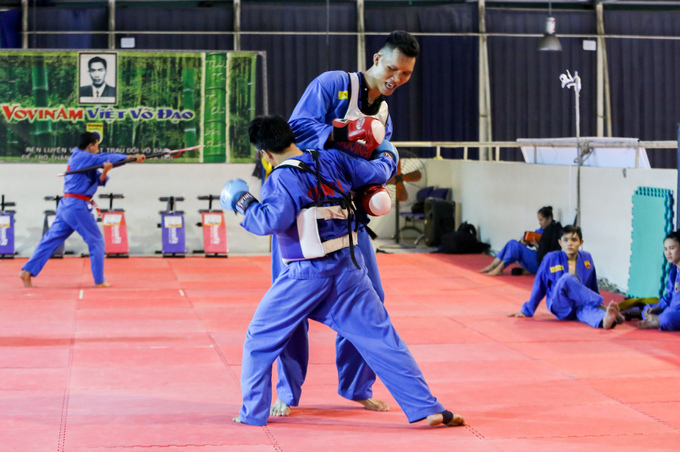 Around that time, the Vovinam’s coach thought that I was good enough so he told me to join the team," Tu shared. "My height is an advantage and also a disadvantage. Large build makes me not as quick, causes slow reflects and lose strength faster. With the supports from my colleagues and coaches, I have to train harder to improve my performance," he said. Tu’s highest achievement in Vovinam is a national silver medal. After training, Tu mostly just stays at home. 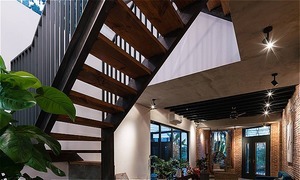 The corner near the staircase is where he sleeps because there are no bed that fit. He shared, he doesn’t have a lot of friends, also doesn’t go out much since he’s self-conscious about his height and usually keeps to himself. Sometimes, Tu accepts modeling work to earn extra income. 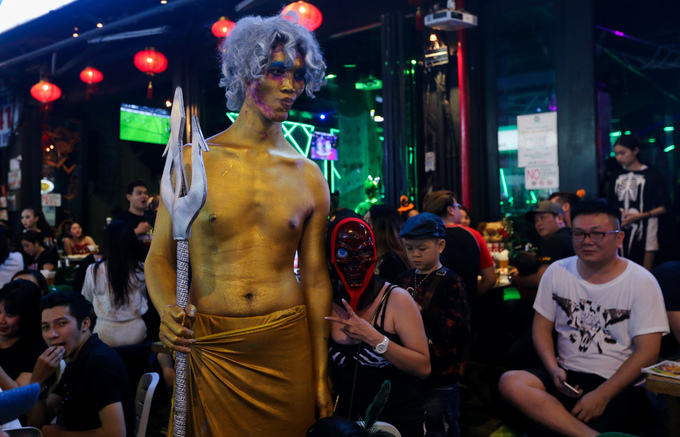 On Halloween day, he dressed up as Poseidon and walked around Bui Vien Street in District 1, HCMC. 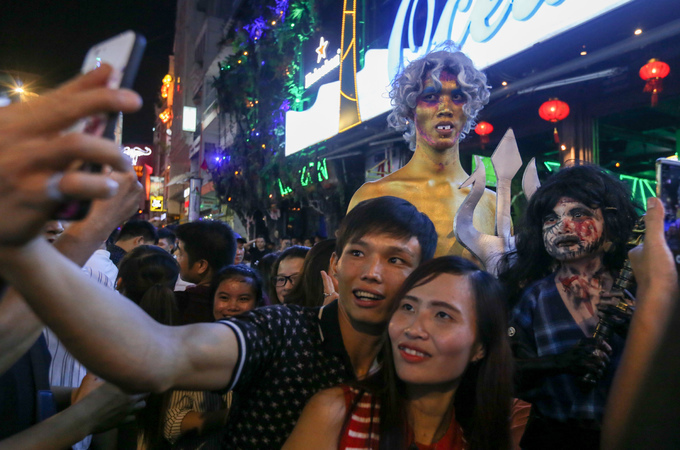 "Everywhere I went, I was the central of attention, everybody wanted to take photo with me. 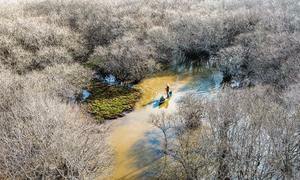 At first, I was a bit uncomfortable, but then I got used to it," he said. Tu used to work as a security guard at a bar, but since he had to stay up late, which affected his martial arts training, he quit. 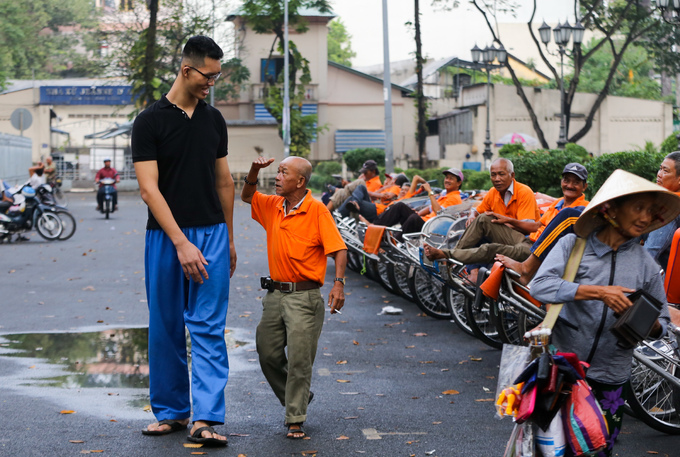 He said he’s looking for day-time security jobs or something that is "suitable" with his height. "Others want to be tall, but I wish I can be around 1.6m. I don’t want people to stare wherever I go," Tu shared. "I always get so much attention, I don’t go out often. People usually just run over to me and ask me all sort of things. Sometimes, they even ask if I can find a wife or if there will be a coffin big enough for me when I die."